Overkill Tuning - Provides the biggest bang for your buck, the improved throttle response and transmission changes make the big vehicle feel lighter on its feet and new modifications are supported as you add them so it's not a one and done tuning deal. 80mm Throttle Body - With the intake system done, look at our 80mm throttle body. The C/C intake manifold already has an 80mm inlet, its flow will be maximized with our throttle body upgrade, better throttle response and top end horsepower. JacFab Intake Manifold Spacer - Available from JacFab directly by purchasing the 2012-15 Camaro V6 spacer. This intake manifold spacer increases manifold air volume, lengthens runner length, both of which add low-mid rpm torque, great for this pickup platform. More minor mods - Exhaust work is small gains on the 3.6, you can install the mufflers you like and gain more sound than horsepower. We are very pleased to be a premier tuner for the 3.6 Direct Injection LFX V6 found in your 2015 to present Colorado and Canyon V6 pickups. The focus on our C/C tunes is make this 300 horsepower truck FEEL like a 300 horsepower truck through improved torque settings on the engine tune, much improved throttle response and much improved transmission shift behaviour that will make the truck feel lighter on its feet. Improved response and more natural feel from the throttle pedal, NO NEED FOR EXTERNAL THROTTLE BOOSTERS! Transmission Tune : Fully rewritten transmission shift points will downshift with less throttle input, upshift at better engine rpms, reduce bogging around town, and improve how the vehicle feels by feeling lighter and easier to drive. This is one of the most common complaints on the new Colorado/Canyon, you'll love an overkill tuned transmission! Tuning available for RIPP Supecharger Kits, Overkill is an LFX Forced Induction tuning specialist! Specialized in the LFX motor. From revised cam phasing, fully reconstructing spark timing tables and fully revised throttle calibration, an Overkill tune is more comprehensive than what you'll get at your local dyno shop. Our tuning includes comprehensive peformance calibrations on both regular and premium gasoline, and on E85 Ethanol; our competitors commonly don't offer 87 octane performance tuning. Autocal Handheld: The best way for us to provide tuning for your C/C pickup is through our Autocal handheld system. The Autocal handheld allows you to take the handheld to the vehicle, read the factory file, upload our Overkill tunes and provide scan data using just the handheld unit inside the vehicle. Return to stock calibration whenever you want, apply updates and retunes easily through email with us and Overkill retuning is available at no charge for as long as you own your vehicle. You'll need a computer that can run a windows based program and has a USB port to transfer files to and from the handheld. Overkill is also a Diablosport custom tuner. Already have an Intune or Trinity from Diablosport? Upgrade it with Overkill tuning! You'll receive our Overkill tunes and tuning support for as long as you own the truck. Overkill tunes get loaded to the handheld and can be flashed just like the Diablo tune. 87 octane, 91/93 octane and E85 tuning all included in the purchase. 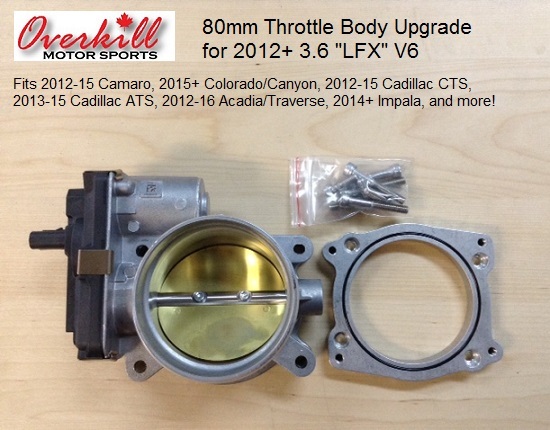 The only larger throttle body for the 2012+ LFX 3.6 is available here at Overkill. The factory throttle body is 72mm. Our 80mm throttle body solution dwarfs the stock unit and bolts directly to your Colorado/Canyon intake manifold which already has a 79.5mm inlet to take full advantage of this larger throttle body! One of the best upgrades you can do beyond our tune, this throttle body setup will improve horsepower at a dyno tested 11+ wheel horsepower, improves throttle response (particularly with Overkill tuning) and changes the intake note of the V6 to a deeper growl at heavy throttle. Throttle body is a brand new unit, comes with an aluminum adapter plate, stainless steel bolts and some parts to assist installation. 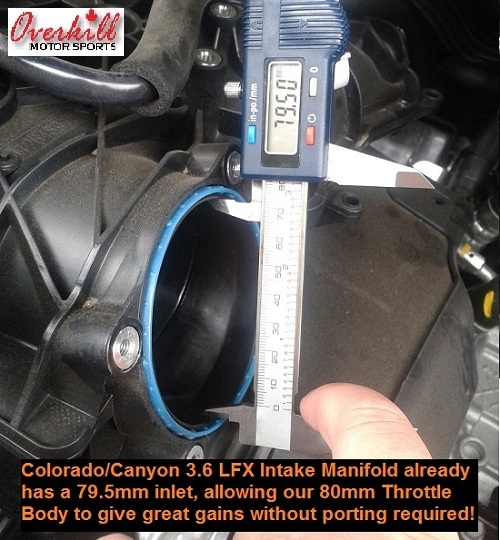 Tip: This throttle body has a 3.5" clamping area, compared to the factory throttle body of 3". Ensure you have a solution available before installing the throttle body! Requires no tuning but works even better with Overkill tuning (if you're an Overkill tune user, you get a no charge revision for your Autocal).